Home / Entertainment / News / Joyce Bernal on SONA: "Kailangan ba magbayad? Hindi ako magpapabayad"
Joyce Bernal on SONA: "Kailangan ba magbayad? 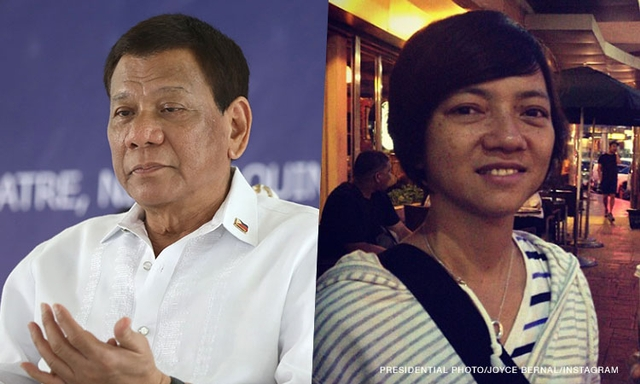 Hindi ako magpapabayad"
Film and television director Joyce Bernal on Wednesday, said that she will be directing President Rodrigo Duterte's third State of the Nation Address on Monday for free. Asked how much she will be charging for the service which was done by director Brillante Mendoza last year, she said she did not ask for a cent, but will do it for the spirit of nationalism. "Tinawag po ako e bilang mamamayan so, ok po. At saka presidente natin siya and para din po sa mga tao ‘to, sa mga kababayan natin, para sa kapwa ko Pinoy," the director said. She further added, “Kailangan ba magpabayad doon? Hindi ako magpapabayad doon." Mendoza, who did the directing of the previous SONA's, admitted that he also did it for free. Known for her romantic films and comedies, Bernal would be directing the SONA for the first time. Bernal earlier said she intends to use "sequencing shots" and "warm lighting" to capture Duterte's patriotism on camera. Bernal's most recent works that turned to box offices, "Gandarrapiddo: The Revenger Squad", "Last Night", "The Super Parental Guardians" and "Everything About Her". Bernal is also a single mother to her daughter Liam, who goes to the University of Sto. Tomas. She earlier the House of Representatives where the SONA would be held on Monday. Malacañang earlier said that President Duterte's speech this year will only last for 35 minutes since he promised to read from prepared remarks. However, Presidential Communications Secretary Ana Marie Banaag on Tuesday, hinted that the President's speech may last longer. "Even if the President talks for two hours, people are so fixated on what he wants to say so it's not really something we are worried about," she said. Unlike Mendoza, who drew several reactions for his unconventional use of shots and camera angles in the President’s speeches, Bernal "has not so deviated with the usual protocols and procedures," according to Banaag. "Director Joyce Bernal is so hands on. She practically stays at the Malacañang and House of Representatives," Banaag said.